He tear-gassed infants and small children. U.S. Border Patrol agents have been massed to meet a group of asylum seekers in Tijuana, Mexico. 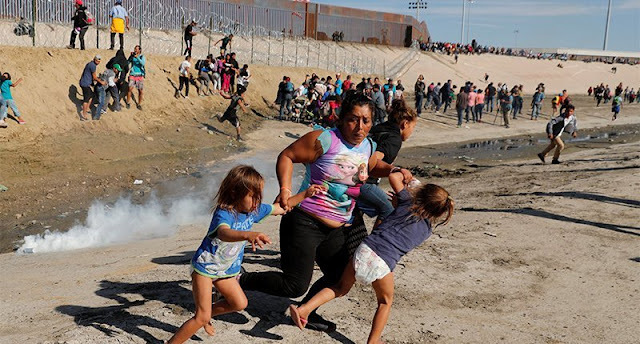 Today, they fired tear gas across the border into Mexico at several hundred of that group who were attempting to walk across the border adjacent to an official checkpoint. The "caravan" has assembled in Tijuana, in full view of officials on both sides, to claim refugee status. It is not guaranteed, and they may be deported if their claims are rejected. Under U.S. law, it is legal to cross the border at any point to present an asylum claim. Last week, a federal judge blocked an attempt by Trump to circumvent this law. Because it involves the tear-gassing of infants and children.